Fascism goes beyond Nazi Germany. Based on a true story, a young 1967 history teacher dealing with The Vietnam War and integration into the public school system, tries to deter his students from the allure of fascism through a daring social experiment that spirals out of his control. The "experiment" illustrates how individual freedoms can be quickly abandoned and willfully repressed for collective goals and racism as happened in the rise of Nazi Germany and the treatment of the Jews during World War II. Themes: History (WWII + Vietnam), Diversity, Anti-Bullying. "Kovach is an engaging and agreeable storyteller who holds our interest throughout...“The Wave” makes for thought-provoking Fringe viewing." "Kovach commands the stage and his audience with ease." "Truly interesting... Deftly illustrates how individual freedoms can be abandoned for collective goals." In 1976 Ron Jones wrote a short story titled TAKE AS DIRECTED based on his own experience at Cubberley High School in Palo Alto, CA 1967. This was adapted into a novel by Todd Strasser (required reading throughout US schools), and shortly after into an "after-school special" film by Norman Leer. 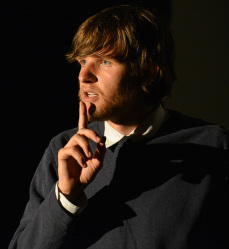 Ron Jones performed a storytelling at Cowell Theatre in San Francisco, CA, and a documentary LESSON PLAN by Phillip Neel was created in 2010. Co-authored by Jon Kovach, The Wave is an adaptation created from Ron Jones' original short story, live storytellings, and poetry. Our production premiered at the '13 Cincinnati Fringe Festival, and has since performed at the San Diego Fringe, The National Underground Railroad Freedom Center, high schools across the Mid-west, and Bay Street Theatre.